This set of 4 heavy duty triage tarps will enable first responders and CERT teams to quickly set up a triage area. In a natural disaster situation, triage work cannot be delayed to set up canopies or tents. With this set of 4 tarps, each measuring 16' x 20' , triage areas will be clearly marked right from the start. 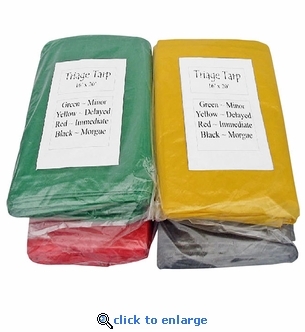 Set of 4 heavy duty triage tarps. Material: 5 mil thick vinyl with grommets. Red - Seriously injured or critical, in need of immediate medical attention. Yellow - Seriously injured but not immediately life-threatening. Green - Non-serious injuries or "walking wounded".